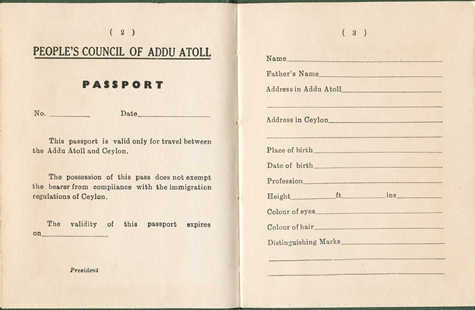 The Passport of the Suvadives issued by the People's Council of Addu Atoll was the first passport issued in any part of what is now the Maldives. This was valid for travel to Ceylon (Sri Lanka) and was fully recognised by the Ceylon authorities. From 1947 to 1965, Maldive citizens travelling to Ceylon carried a "Pass" issued in Malé and endorsed with an entry visa which was also issued in Malé on behalf of the Ceylon immigration authorities. Maldive citizens travelling beyond Ceylon used British passports issued by the British Representative in Malé or the British High Commissioner in Colombo. Until 1947, this was issued by the Governor of Ceylon. Until then Maldive citizens did not require passports to travel to possessions and dependencies of His Majesty the King or His Imperial Majesty the Emperor of India. The first passport issued in Malé by order of His Majesty the King of the Maldives came into existence in 1965. The People's Bank of Addu Atoll in the Suvadives was the first bank in what is now the Maldives. The Malé government caught up with the modern world in terms of banking in 1974 when a branch of the State Bank of India was opened in Malé. The first Maldive owned bank - the Bank of Maldives - was established in 1983 with Bangladeshi backing. This was well over 20 years after Addu Atoll established its own bank. The currency of the Suvadives was the Pound Sterling. 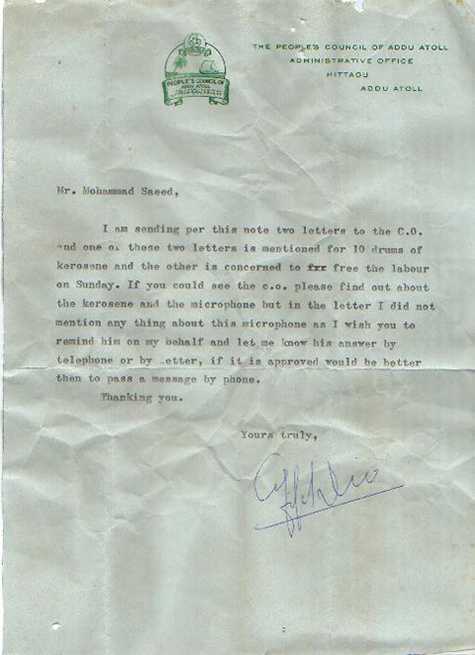 The above is an official letter signed by His Excellency the President of the Republic Abdullah Afif Didi. The letter is written on a letterhead of the People's Council of Addu Atoll displaying the Coat of Arms of the Suvadives.